• Stainless steel; Baked enamel; solid plastic doors, panels and solid plastic pilasters are 1" thick; Stainless Steel and Baked neamel pilasters are 1-1/4" thick. Metal; 3/8" diameter, 3-3/4" long. 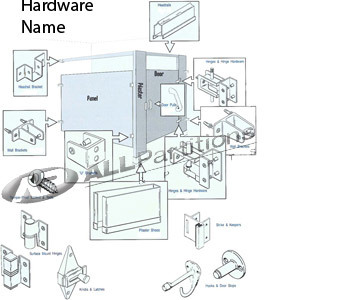 Bottom door insert in unplated/unpainted finish, part number 1005B. Or in bright chrome finish, part number 1005BC. Use part #2500B or 2500C. Chrome plated zamak. For inswing or outswing doors. For 1 1/4" thick square edge pilaster. 1-1/2" hole centers. For round shaped concealed latch slide pin.